but move from your place. Rabbi Kaya Stern-Kaufman,MSW is the Founder and Director of Rimon Resource Center for Jewish Spirituality in Great Barrington, MA. www.rimonberkshires.org. She is a former psychotherapist and feng shui practitioner with a life-long interest in comparative religion and the creation of sacred space and sacred time. 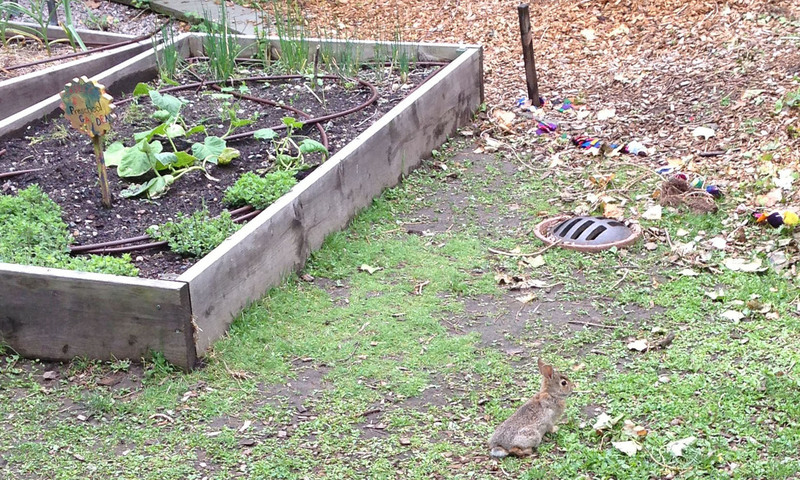 When I first saw evidence of the rabbits over the winter I didn't totally understand the implications. Ever the optimist, I thought they could hang out in the ivy, frolic in the playground (once the pre-school kids left) and generally leave me and my vegetables alone. They could have their space, and I’d have mine. When I could take it no more- I bought Havaheart trap. 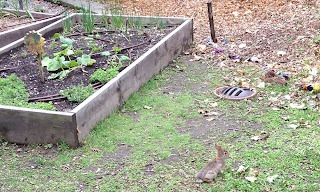 The first morning when I went to go check the trap, I wasn't sure if I really wanted to find a rabbit inside. Although I had located a lovely new home (more then two miles away, by the water, it also included a bridge and a bench, in addition to a wide grassy area) I was nervous. If I hold their lives as sacred, their creation as an act of divinity, then shouldn't we be able to co-exist in teh garden together? G!d speaks the Divine name twice! Wouldn't once be enough? Whose attention is G!d trying to reach? The medieval commentator Rashi teaches that “Adonai” is G!d's attribute of compassion, and that the Divine Name is said once before a person sins and once after the person sins and repents. It’s a nice image. I think also about Rabbi Arthur Waskow’s understanding of the four letter tetragramaton as a breath that happens when we try to pronounce the unpronounceable name, and he refers to G!d as the Breath of Life. So, the Divine Name being spoken twice is sort of like G!d breathing deeply twice, one before we sin and once after we sin and repent, or, in the verse above, two deep breaths before naming the aspects of Divine mercy and forgiveness that are available to us. Jewish tradition teaches that we are to walk in G!d’s ways. Accordingly, this means that we, too, need to have all the qualities of forgiveness listed in this verse. The compassion to a thousand generations might be tough for one individual, but at least we can try to be merciful and gracious, slow to anger, abundant in goodness and truth, and forgiving of other’s transgressions. And taking two deep breaths can help us just as much, or even more, as it can help G!d! If we breathe deeply, letting the air in and out, with conscious awareness that we are bringing into our bodies molecules that were released from some other organism or from the Earth, perhaps we can better manifest in ourselves these amazing Divine qualities. Philosopher and nature writer Kathleen Dean Moore writes in The Pine Island Paradox: “if you sit still in the dark, breathing quietly, the world will come to life around you…and then you will understand: you are kin in a family of living things, aware in a world of awareness, alive in a world of lives, breathing as the shrimp breathe, as the kelp breathes, as the water breathes, as the alders breathe, the slow in and out. Except for argon and some nitrogen, every gas that enters your lungs was created by some living creature—oxygen by plankton, carbon dioxide by the hemlocks. Every breath you take weaves you into the fabric of life." When we are confronted by a difficult situation with another person, if we breathe deeply and remember the water, the oxygen, the nitrogen; the rain, the oceans, the mountains; the rain forests, the deserts, the water’s edge; the frogs, the salamanders, the bacteria – if we in those two deep breathes can allow such images to pass through our minds, reminding ourselves that we are but one tiny part of the amazing web of life on this amazing planet, and that the Breath of Life sustains us all, perhaps we will find it easier to walk in G!d’s footsteps and to be merciful and forgiving. Perhaps we will be able to look more kindly at our neighbors and ourselves. Perhaps an abundance of goodness and truth will seep into our beings, and bring healing to us and to the Earth. With all my heart and all my soul, I pray, may it be so. Amen. Selah. I am helped by...Remembering that where ever I sit or stand, it is sacred ground. Sometimes it is hard to believe this wisdom. But, If I can re-remember my roots, and my strong belief that we are all apart of the on-going cycles of creation and of unraveling, then I can wake up and realize the miracle of this moment. One of my goals for this summer was to slow down, and honor my desire for living closer to the land and water, in my neighborhood. But in between watering and harvesting for a few backyards, I have traveled all over New England. I went to a Slow Living Summit in Brattleboro, VT. I found and sold an antique (1740's) map in Hyannis, MA. I went to a Social Justice & Storytelling gathering in New Hampshire, and experienced the strong earth energy at The Round House in Colrain, MA. We also celebrated the crossing over of two special elders who live with me in Wayland Housing. And participated in Ma'yan Tikvah's Shabbat in Nature retreat in mid-August. As Molly B. wrote, how does it all this cook nutritious bread? This summer, I have experienced so many others working to make our world work for the present and for the future. Maybe all religions foster a love and awe of the past, our roots. The exhibit of the Dead Sea Scrolls at The Boston Museum of Science, is a journey into the past. Two thousand years ago, our ancestors made pots, and ink, and parchment. They lived in uncertain times, but they left us with their seeds, the work of their hands, and their written instructions for meeting the end. The end of existence is what the scroll scribes predicted. They were getting ready for their last breaths. What will we be getting ready for this year? We have the science, the evidence of global warming and the rise of the waters. We have people living under tyranny, and those trying to take back their humanity.Our people are recovering from nearly loosing our footing on earth. I imagine that while I continue to struggle with budgets, and making real food, hopefully, I will be thankful for these daily struggles and the awareness that I am standing or sitting on Sacred Ground. Nyanna Susan Tobin is an Organic Storyteller, Member of Wayland Transition, loves real food, and can often be found walking with her dog and Wellness Partner, Ziggy. Earth Etude for Elul 21 - How Do You Meet the World? There are many ways to look at life. This lens through which we perceive reality affects how we feel and how we act. Elul, a time of returning, is a perfect opportunity to reflect on our lenses. Is our outlook truly helping us be the best self we can be? Sometimes we can get into phases where we're caught up in one particular lens. You might notice a particular pattern of thought you're reenacting, along with some habits. For example I noticed that I was in an "afraid of the world" phase where I was checking the national news multiple times per day. I was stressing about how the economic turmoil of our country is and will affect me and my community. This certainly wasn't the only line of thought I had, but many of my thoughts were pretty grim. At the same time, you can't entirely dismiss this as some unfounded fear. The cost of living, food and energy continue to rise and though the financial experts keep talking about a recovery, real incomes and the rate of employment are not keeping up. On top of this we're getting more extreme and unstable weather from climate change. You can see how this might shape my outlook. We can get stuck in a specific outlook, but there are alternative ways to approach at the world. When I recognized this phase I paused to connect with the specific emotions that came up for me: fear, mostly. 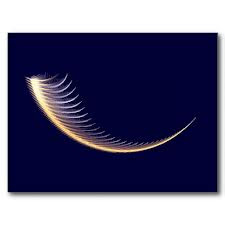 Meditating on this, I soon remembered another outlook were I see my actions as the "Earth acting through me". 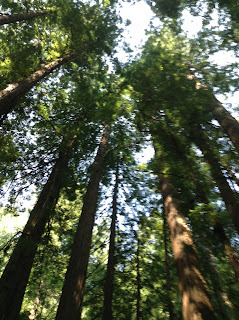 In this frame, I feel connected to the world around me (instead of afraid of it) and focus on asking, "at this very moment, how can I contribute?" Notice how this opens me up to options. Suddenly I'm thinking about the solutions to our economic woes. Thinking about what could make our communities more resilient I start asking open-ended questions: How many different ways can I support local agriculture? Low-energy and low-cost transportation? Healthy living? Connection to the physical planet and real ecosystems of which we are a part? You can probably see how this approach is more likely to help me find a meaningful way forward. In fact, this reminded me of why Tikkun Olam initially pulled me into the Transition movement (a grassroots, community-level-focused effort to transition beyond fossil fuel dependence to a world of renewable energy and local resilience). The Transition approach is to look at change as an opportunity. The other key element is that we act in groups because it can be overwhelming on our own. Ultimately a few of us got together and co-founded our local initiative, Transition Framingham. Look around, you might find a group in your town (Wayland, Ashland, Sudbury and more) or maybe you have the opportunity to start such an effort! So in this etude I leave you with two lessons for the price of one. What outlook have you adopted? Is it creating outcomes you like or behaviors you'd like to change? How can we return to a stewardship relationship with the Earth we all call home? Alexander Volfson, a humanist and Earth-ist, loves finding way to bring folks together toward sustainable lifestyles. When he's not fixing thing (from appliances to bicycles to computers) or planting them (for a permaculture designed garden), he's biking somewhere or learning something new. Alex is one of the founding organizers of the Framingham Sierra Club and Transition Framingham. The sabbatical year, or shmita (meaning 'release') is the seventh year of the seven year agricultural cycle described in the Torah and applying to the Land of Israel. During the shmita year, the land lies fallow, debts are forgiven, and all of creation is allowed to rest. In this country, land set aside as conservation land is allowed to rest for long periods of time. Such land opens up for us many wonders that we might otherwise miss. 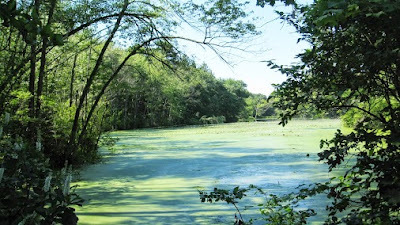 These are images from our Shavuot hike at the Massachusetts Audubon Society's Wachusetts Meadow Sanctuary. The year 5775, beginning on Rosh HaShanah 2014, marks the beginning of the next Sabbatical Year. During this year, according to Jewish Law in the Land of Israel, debts are to be forgiven, agricultural land is to lie fallow, private lands become public, stored food and perennial harvests are to be redistributed to all. How can thinking about shmita change our thinking and our world? How can we use this year of 5774 to prepare us to observe shmitah? For resources to help your thinking, check out The Shmitah Project. Robyn Bernstein is the President of Ma'yan Tikvah - A Wellspring of Hope, a music therapist, and an active member of September 11th Families for Peaceful Tomorrows. If I want to pray in the language of my people, I’ll need to start walking in the early morning—not quite this early, but not so far ahead, up the hill and through Franklin Park, past the living zoo and the old, abandoned cages beyond that, past the Stadium to the bright oranges and blues of Jamaica Plain. The path is calm and welcoming enough, but often it isn't mine, I don’t make it out there. 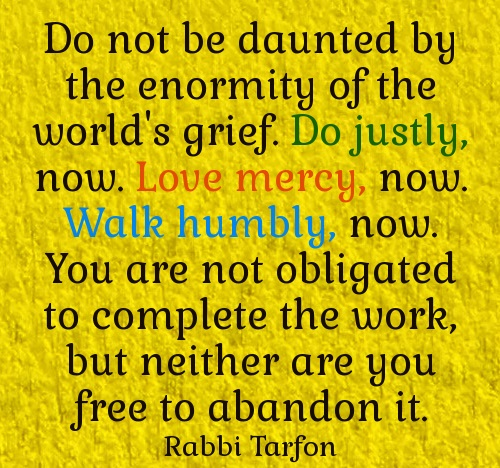 I had a ready answer for my brother: Rabbi Tarfon's dictum in Pirkei Avot, Ethics of The Fathers (2:16), which is one of the 63 short books that make up the Mishna, but the only one that does not deal with laws, but rather, moral insights: “It is not your responsibility to finish the work [of perfecting the world], but you are not free to desist from it either.” 'Nuff said. And my brother agreed. 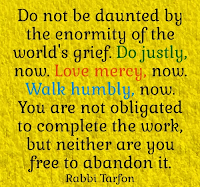 I believe that Rabbi Tarfon's advice is so profound that indeed, he stated what most of us already intrinsically know. Still, it never hurts to hear it, especially at this time of soul-searching and new beginnings. It reaffirms what for many of us is a long struggle that, despite its frustrations, is still one we would never abandon. In June, President Barack Obama exemplified this way of thinking when after years of fruitless efforts to pass climate change legislation, he actually stepped aside from the lawmaking body of America and took direct action on his own. And he did it forcefully, bypassing Congress with conviction and determination, with little regard as to how his words would be taken. “There is no time for meetings of the Flat Earth Society,” he pronounced. After laying out the price in lost lives and great governmental expense already affecting the world's population, which he said will only become higher, he invited us to work along with him. "If you agree with me, I'll need you to act," he said. "Remind everyone who represents you, at every level of government, that there is no contradiction between a sound environment and a strong economy – and that sheltering future generations against the ravages of climate change is a prerequisite for your vote." And he also urged other, wealthy nations to join this “coordinated assault” on pollution. "The United States cannot do it by itself," he said to a group of young people in Johannesburg. "I expect it's going to be your generation that helps lead this, because if we don't, it's going to be your generation that suffers the most." Obama then laid out new regulations on heat-trapping carbon dioxide that is released by new and existing power plants, as he described impending efforts to increase renewable energy production. These include raising efficiency levels on appliances and machinery and instituting protective measures for communities facing higher temperatures and rising waters. And the striking part was that none of his plan's components require congressional approval. Naysayers, even from within his own party, have complained and even threatened legal action, saying that his proposals will kill jobs, destroy the coal industry, and create other impediments to our usual, carefree way of life. But Obama made his weekly radio and internet address and launched his campaign on his own because he knew it was the right thing to do, and indeed, the necessary thing to do. His was an ethical action that outweighed any risks. "The question is not whether we need to act. The question is whether we will have the courage to act before it's too late," Obama said. Rabbi Tarfon would be nodding in understanding. Susie Davidson, a local journalist, author, poet and filmmaker, is the coordinator of the Boston chapter of the Coalition on the Environment and Jewish Life (COEJL). She writes for the Jewish Advocate, JNS.org, the Jewish Journal, the Jewish Daily Forward, and other media, and has contributed to the Jerusalem Post, the Boston Sunday Globe, and the Boston Herald. She coordinated the OccuPoetry series at Occupy Boston. She is also an active board member of the Jewish Alliance for Law and Social Action (JALSA) and the Alliance for a Healthy Tomorrow (AHT). I think a lot about memory as I listen to my 93-year-old mother. Her short term memory has changed to the point at which she rarely remembers what or if she has eaten a few hours ago, but she thinks a lot about her childhood and into her married life 60 years ago. She says that she doesn't miss people so much but that she misses scenery. While I know that my mother does miss people, nature has played a large role in her life. Often misunderstood and criticized at home, she found relief and comfort in the summer Catskills, able to explore by herself or sit on a porch in the company of her friend's dogs. Closer to the city, she remembers being at the beach, the women finding refreshment from the heat by splashing ocean water down their bathing suits. She says that she was touched by my father's concern over who would feed the pigeons in Central Park after a big snow. My mother has passed along her love of the outdoors and exploring. To this day she notes how clouds resemble animals or faces. We have looked at the different types of dogs being walked on the street--the curly tail, the graceful walk, the intelligent eyes. We spent a lot of time outside during my childhood summers, enjoying trees, parks, the rivers, sunset at the beach, the bus/ferry/bus trip to the Tibetan museum set on a hill. I do better with my mother when I remember how much we both love nature. Time with her often feels short. The crammed schedule of laundry/shopping/dishes while answering her repeated and incessant questions tries my patience and brings frustration. 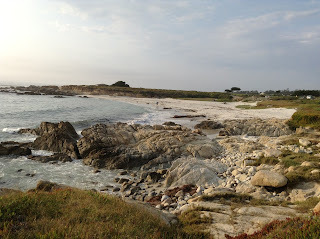 When I take time, however, to gently show her my outdoor photos, to let her talk about her associations, we are both comforted in our connection to each other and the worlds we have shared and continue to share. Rosh Hashanah and Yom Kippur are not so different from the state in which my mother and I find ourselves. We all have a past, a present, and a future, however much of it we take in or know. The coming and going, the routine care of our physical needs, the frustration with obstacles (real, imagined, of our own making) bring us only so far. Remembering to remember, stopping to let something else take root, feeling who we are at our best. Knowing that time is short, we can yet again find comfort and strength to begin anew. 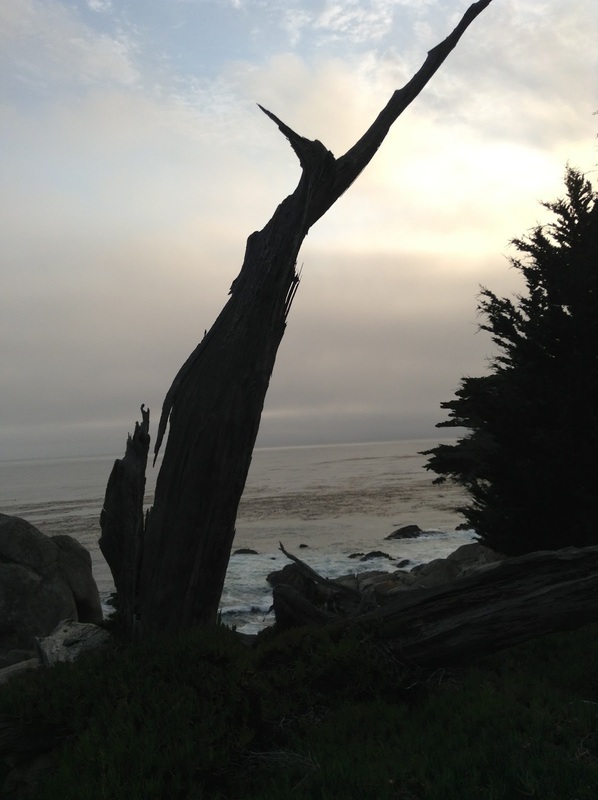 Taking strength from the natural world, from our deepest inspiration, and from each other, we create the year anew. May we do a little better this year! Carol Reiman enjoys the outdoors largely in the greater Boston area while traveling from/to home, library work, her mother, pets (care/sitting). She finds additional strength and comfort in other activities, including community in Temple B'nai Brith and Ma'yan Tikvah. I read this midrashic story only recently, decades after I was a teenager sitting in the pews at Temple Beth El of Great Neck. I was listening to Rabbi Jerome K. Davidson deliver his sermon. He was speaking about how it is against Jewish values to litter and to pollute the air and seas. He was disheartened whenever he saw people dumping the contents of their ashtrays onto the roads and sidewalks. Perhaps Rabbi Davidson was thinking about this Midrash when he said that Jewish ethics require that we do our part to take care of the earth. Maybe he was thinking of another Jewish textual basis of our obligation to care for the environment, for we find such bases in the Bible, Talmud, Midrash and Law Codes. Jewish thinkers in every generation and in every part of the world have urged us to care for our planet. Why, then, don’t we remember? Why don’t we listen? There are many reasons. Some of us fall short of our obligation because we are forgetful, greedy or ignorant. Some of us miss the mark because we are lazy, oblivious or selfish. Fortunately, at this time of year we are given the opportunity to ask ourselves tough questions, such as: How has my conduct caused damage to the planet? How can I change my behavior so that I stop hurting, and start healing, the earth? Can I encourage other people to make these changes too? Changing our behavior isn’t always easy. It takes time to undo bad habits and replace them with new ways of doing things. All of us have been successful in modifying our behavior in the past. We can do it again. We can make the changes needed to help improve our world. May we start today. Rabbi Laurie Gold was ordained by the Academy for Jewish Religion. She works for Chapin Home for the Aging in Jamaica, NY. Laurie also serves as rabbi for Holland America and Celebrity Cruise Lines. Laurie resides in Queens with her wife Nancy. They enjoy bike-riding, swimming, jogging and traveling together. Last night I returned from a week-long trip out west with my brother and his family. My brother planned a wonderful itinerary and I was gifted with seeing and experiencing the magnificence and beauty in nature. 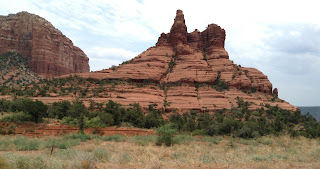 I saw Muir Woods, Scenic Coastal Route 1 in California, the Grand Canyon, and the red hills/mountains, in Sedona. In these places in California and Arizona, it was easy to feel the awe and joy of the universe, and now that I'm back home, in my apartment, with all my things taking up space, I feel more challenged to stay in touch with the beauty and spaciousness of the earth. 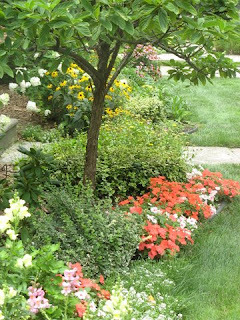 But even with the heat and high humidity, it's worth shifting some of my attention from the discomfort of the heat and the tasks that need to be done to the beauty of the earth. Looking outside my bedroom window, on a very hot humid day, I see the familiar beautiful large tree with leaves and branches moving in a gentle wind. I've lived here for over 15 years and always thought the tree was a maple, but in looking at the leaves now, I realize it's not. I'm not sure what it is, so I'm excited to have a chance to learn something new about this familiar lovely tree friend. I've been away and my garden has lots of weeds. I can turn away with displeasure, or I can choose to appreciate the fertility of the soil that allows those weeds to grow. Some even have flowers. What is it about weeds that gives them a bad name? They are wild, uncultivated beauty-the gifts that come without asking. Perhaps, it's just a matter of perspective? Looking out through the window of my study, I see a number of trees and bushes in the neighborhood. 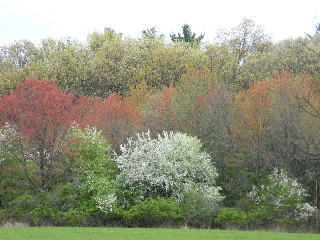 I'm enjoying the variety of hues of green, and the distant tree with purple leaves-maybe a red maple? I'm also enjoying the shadows that shift under the tree closest to my view. Oh, there are also houses and several telephone wires outside the window, and I ask myself how to see the beauty in them. A thought occurs that I can use the wires to look at slices of the scenes-looking at the scene between each two wires. There are lots of options, if I pause and ask what's possible in each situation. And I actually like the colors of the white and red houses within view. There is so much beauty and good in the world, and, I get caught up in my daily chores and issues and forget to notice and appreciate the good and beautiful that's in my life. Going on vacation to beautiful spots in nature is a reminder to RETURN (t’shuvah) to a practice of regularly taking a stance of gratitude, awe, and/or appreciation for our many gifts. Lois Rosenthal is a member of Temple Tifereth Israel in Winthrop, MA. In addition to participating in Shabbat services, she works with Hebrew School students, prepares students for Bat/Bar Mitzvah, and regularly gives divrei Torah. Previously, she was an academic in the sciences. Fall is the season of change. Leaves turn colors, days grow shorter, and birds begin to migrate. Animal fur grows thick; layers of fat are laid in. Water warmed all summer by the sun slowly begins to sink to the bottom of the lake and displaces the colder less dense water. Everywhere you turn, change is in the air. When I think of the high holy days I think of change. Our ancestors called this change teshuvah. Tradition understands teshuvah to mean repentance, which in turn implies contrition or regret for past wrongs. It also generally assumes a personal commitment to change. Change as a corrective activity has its place. In fact, some say the fundamental difference between humans and animals (I think this really means all of nature) is that we alone have the ability to reflect upon, and review, our past actions; and presumably change. In religious terms this means that we alone have the potential to do teshuvah. I suppose this is true and in any case it doesn’t hurt to believe it is so. However, what is true is this: change is fundamental to all of nature and despite a inclination to deny it this includes us, for we are no more or less a part of nature than anything else in the universe. Change in nature is neither good, nor bad. It simply is and that is enough. Our liturgy and rabbis are steadfast in urging us to “do teshuvah” this time of year. It is good we are told, to reflect upon our past actions, seek forgiveness and commit to refining our behavior. I wish our tradition put less emphasis on change as a corrective action. I think this just makes it that much harder to embrace change in our lives as something healthy and natural. Howard Cohen is rabbi at Congregation Shirat Hayam, Marshfield MA. He is the Senior Guide/Owner of Burning Bush Adventures, Co-Rabbi Congregation Beth Israel, and 1st Lt. Bennington Village Fire Department. He lives in Bennington, VT on Barefoot Farm. My younger son left on July 16 to take a job in Israel. As he was packing, he asked me when would I visit him. I choked out the words, "I'm not going to visit you." Actually, I would love to visit, see what his life is like in Tel Aviv, and spend time with him. Yet, I'm afraid my trip would destroy his future. If I visit, flying 12,000 miles round-trip, my share of the plane's carbon emissions would be 3 metric tons. The worldwide per capita target for carbon emissions, if we are to control climate change, is 2 tons per year. I would exceed my annual goal in one trip. How could I do tshuvah for such huge emissions expended to satisfy my desire to see him? Absurdly, I know one person's trip doesn't affect the climate, but our collective choices as a nation do. So I wrestle with the moral issue involved in visiting my kid, knowing my personal decision is meaningless. Crazy? The dilemma gets thornier because my older son will soon become a father. What will the world be like as my grandchild reaches adulthood? How can I justify taking a trip to visit one son, if it will injury my other son's child? While wrestling with this, I read America's Climate Century by Iowa Senator Rob Hogg in which he says, "I gave up air travel in 2002 for climate reasons." Flying, the most carbon intensive form of travel, releases carbon emissions in the upper atmosphere where they do more damage than emissions at ground level. Hogg emphasizes we don't have to eliminate air travel, but we ought to minimize it. He also argues that every time we decide to change our lifestyle for the sake of the climate, we should write to our elected representatives because they need to know their constituents want climate action. Publicize our personal acts of repentance to guide societal repentance? A new type of communal Vidui? Rabbi Judy Weiss lives in Brookline, MA with her husband Alan. She teaches Hebrew Bible to adults, is co-steerer of Minyan Shaleym, and volunteers with Citizens Climate Lobby. Check out her web page at http://www.apdoo.org/judyweiss/. Step 1 - gather flower petals into a large bowl- ideally four colors and four different species. Bowl is ideally wood but can also be glass or metal. In New England this is a great time of year to find a diversity of lilies, Queen Anne's lace, chicory and aster. Step 3 - ASK FOR SOMETHING. This is for real. If you're going to open up enough to do real t'shuvah/repentance this year, you have to acknowledge that you are not yet whole - that there is something about yourself you want to change, or at least cultivate. A useful formula is "May I be…" or "Let me be…"
Step 4 - Pour the entire bowl of petals and water over your head and proclaim: "Horeini Ya Darkecha - הוֹרֵנִי יְהוָה, דַּרְכֶּךָ - reveal to me your path" - Ps. 27:11. This is both the sealing of our request and also a letting go of wanting only one thing. Sarah Chandler serves as the Director of Earth Based Spiritual Practice for Hazon's Adamah Farm at Isabella Freedman. She is a Jewish experiential educator, community activist, and spiritual leader. She has her M.A. in Jewish Communal and Experiential Education and Hebrew Bible from the Jewish Theological Seminary. Sarah is a student of Kohenet: The Hebrew Priestess Institute, a graduate of Institute for Jewish Spirituality's Jewish Mindfulness Teacher Training, and serves on the Green Hevra Stewardship Committee. This year I decided to take photos of my garden during each of the different seasons, and it is quite amazing to see the development of the various perennials and how the overall face of the garden alters. It is quite astonishing, too, to find flowers growing in places we never planted them – including a beautiful white hydrangea bush that seems to have come from an underground shoot far from its parent plant!! But weekly I also find certain weeds appearing, which I also did not plant nor desired them to grow. 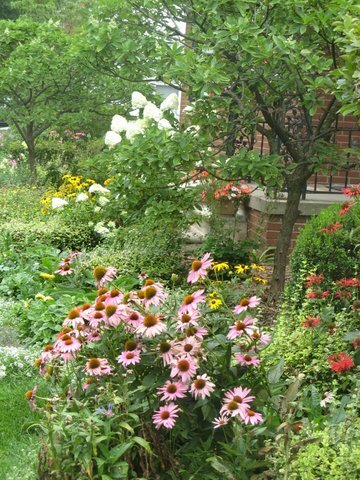 All this only reminds me that as much as I MAY THINK that I am planning and planting this garden, it really is a masterpiece of our Creator, and that I am just a participant in this work. As we begin the month of Elul with our thoughts turned towards the upcoming High Holy Days, we bring forth our own blooms and weeds of this year, some of which we may be surprised to find emerging in the patterns of our behavior, our speech, and our thoughts. Have we unknowingly cultivated these? Which ones do we want to encourage and support? Which ones do we want to cut back or eliminate? And as we recite the Psalms in the morning prayers of Elul, especially Psalm 27, we are reassured that our relationship to HaShem is still intact, that the work of Elul, as Rabbi Michael Strassfeld puts it. is “to recapture a sense of self-worth based on being cherished by the Holy One “and that knowing this we are then ready to not only look at our gardens but also do the pruning, trimming, and replanting for the next year. Rabbi Dorit Edut was ordained by the Academy of Jewish Religion and lives in Detroit, MI, where she teaches and does s rabbinic counseling at the lay-led Downtown Synagogue, the only active synagogue left in the urban center of Detroit. She also heads the Detroit Interfaith Outreach Network which works to uplift the youth and their families in the city, and builds bridges with the suburban interfaith community through numerous interfaith services, cultural events, and social action projects. Married to a now-retired Israeli landscaper, Dorit enjoys gardening, hiking, playing piano, and studying Talmud via telephone sessions with AJR rabbinic friends near and far. So now, when Reb Gendler prays Azamer lelohai b’odi – I will sing praises to my God with my od- from the morning liturgy, and I’ll add the Shema’s V’ahavta, -with all your heart, your soul and your might- (might is literally ‘your very’ as in m’ODecha), these words of prayer become invitations to remember our inner point that is infusing us with all the gusto and gumption we can humanly muster. I know of a teacher who says, “dance from your kidneys”. Here is our version, “sing from your od”.